Don Mardak, CEO of International Monetary Systems (OTCBB:INLM), was interviewed by three business web sites last week. He also announced the completion of another acquisition for Continental Trade Exchange...Barter Network Inc. in the Washington (DC) area. Spreading the word and awareness through his interviews with wallstreetreporter.com, macreport.net, and wallst.net, Mardak explained how commercial barter expands profitability by bringing in new customers and helping utilize excess capacity and unsold time. The interviews can be heard by logging on to the various web sites. The September issue of The Competitive Edge newsletter has an exceptional article which focuses on how to achieve more with less!! Trade exchange owners, who sincerely want to help their clients achieve more, should provide them with this valuable information and powerful way of thinking! For more info on the monthly newsletter click here. Could Barter Industry Be An Answer? The Bureau of Labor Statistics reports that the re-employment of executives between the ages of 55 and 64 sank from 58.8% to 52.5%...the lowest rate since the early 1990s. There is consequently an abundance of intellectual talent going to waste. And due to mergers and consolidation, as well as various industries where drastic downsizing has taken place, many of these jobs are lost forever. This means that a whole generation of people could miss out the last ten years of income needed for their retirement, if they aren’t re-employed. Given the realities of today’s marketplace, and with so much talent and experience, these executives should expand their thinking and look into an exciting opportunity—the barter business! The National Association of Trade Exchanges will meet in Las Vegas, Sept. 9 - Sept. 11 (www.nate.org). 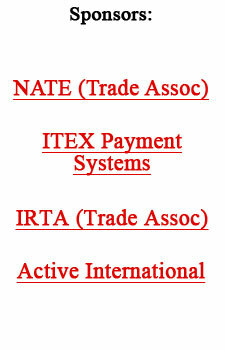 The International Reciprocal Trade Association will convene in Cancun, Sept. 30 - Oct. 3 (www.irta.com). A majority of senior executives, both male and female, at Fortune 1000 companies want to become their employer’s chief executive. The survey by Catalyst, a New York research group, indicates women with children at home yearn to occupy the corner office as much as those without children. The study of 948 officials at the vice president level and above, dispels the popular notion of why few women hold high-level business posts—because they supposedly don’t aim high enough. In 2002, women accounted for only 15.7% of corporate-officer positions and 5.2% of top earners at Fortune 500 companies, a prior Catalyst study showed. Even more telling, the vast majority of women in top jobs hold staff rather than line positions which oversee a business that earns money for their employer. And women occupy just 9.9% of line corporate-officer jobs, those that are most likely to lead to the very top. Women also confront an additional and even more pervasive set of culturally related barriers—such as exclusion from informal networks, stereotyping, lack of role models, and inhospitable corporate culture—experienced by very few men, the report said. To improve women’s chances of taking over the chief executive post, it was suggested that companies formalize career-development programs and give promising female executives more “stretch” assignments. Ginger Lai, founder and president of ABC Barter, located in Alhambra (CA), reports they’ve recently exceeded $1 million in annual multi-directional trades. The company is projecting to more than double their trading volume in 2005. Wealthy Americans showed the highest level of economic optimism in seven quarters, but their spending is stalling slightly amid concerns about Iraq, energy prices and a real-estate bubble, according to McDonald Financial Group’s latest Affluent Consumer Confidence Index. The Conference Board, a private research group based in New York, reported similar results. Their index of consumer confidence in U.S. business conditions is at the highest level since June 2002—a two year high. China entrepreneurs have been told by a top economic official that the government would “encourage, support, and guide” private companies by creating a level playing field for them. This means granting preferential treatment to private companies the same as state companies and repealing restrictive laws. The announcement came four months after the ruling party amended China’s constitution to protect private-property rights for the first time. Bruce Hovis, founder of Jamaica Trade International, located in St. James, Jamaica, passed away earlier this year.